Sometimes if pays to be a card carrying member of the press. 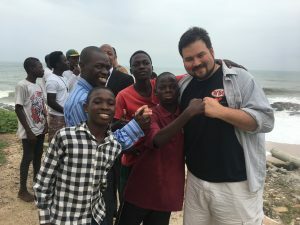 I had been sent to Ghana to cover Issac Dogboe’s fight against Argentina’s Javier Chacon on July 22, 2017…a fight that the local Ghanaian won handily. And after emailing in my report from the fight I was ready to explore the country. 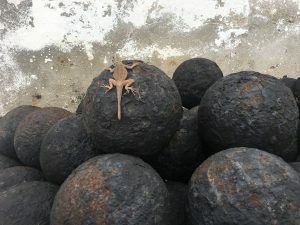 Of course I only had one day to see Ghana. 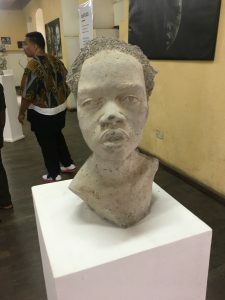 Having elected to fly out the following day to Ethiopia I was unsure of what I would do in Accra, and I grudgingly accepted that I wasn’t going to see much of West Africa. 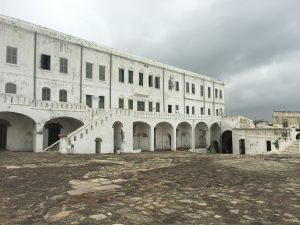 But a chance discussion in the press box during the boxing event had given me the opportunity to see one of Ghana’s most powerful, and important, sites: Cape Coast Castle. 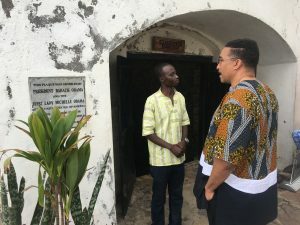 An American businessman named Joseph Trowers who had somehow attached himself to the promotional team in Ghana had invited legendary Boxing referee Tony Weeks to a tour of Cape Coast Castle. I had not been invited, but much like Sam Rockwell’s character in Galaxy Quest, I found a way to beam aboard. 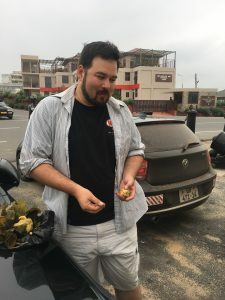 Trowers had arranged a private car and driver for Weeks and I and the following morning I met with the two men at the Kempinski Hotel in Accra, where Weeks and Trowers were staying. 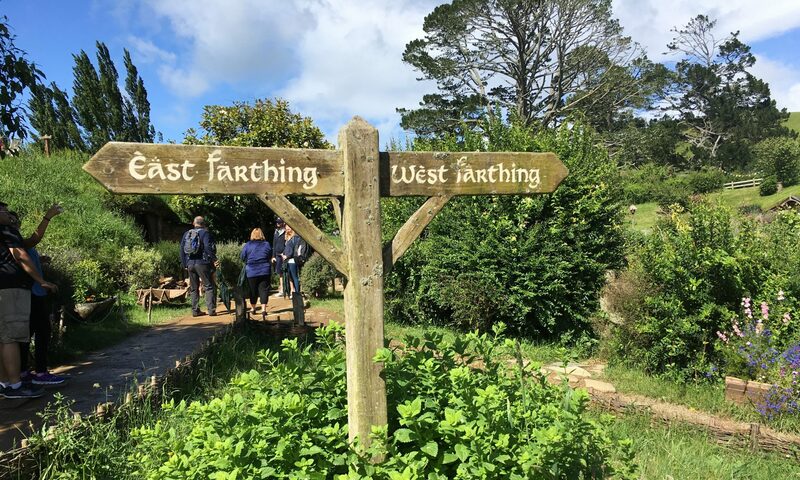 Once I arrived I was pleased to discover that I wouldn’t be the only media tagging along. 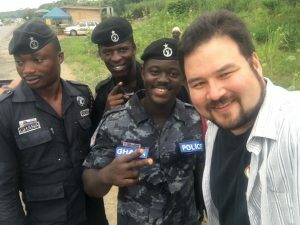 A local radio host named Emmanuel Austin Baah would ride with us while a film crew would meet us there to film Weeks journey for the local press. That was, until they ran out of gas. After making it to the outskirts of Accra we were surprised to see the van carrying the film crew turning away. 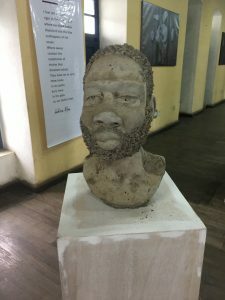 Unfortunately, I would discover that being a journalist in Ghana was not the easiest way to make a living. 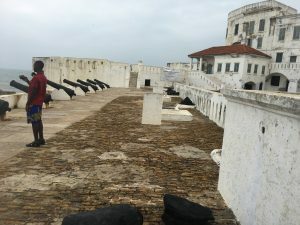 Baah, after calling the other reporters, discovered that they simply didn’t have enough gas to make it to Cape Coast, and it appeared they were too proud to ask us to cover the gas for the trip. 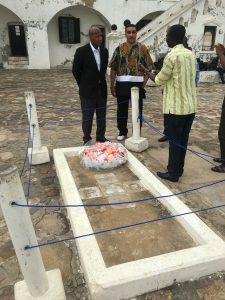 I would discover from Emanuel that such a development was not unheard of in Ghana. He described the difficulty of making ends meet on his end, with much of his income going to transportation to and from work. Even the police operated with tremendous difficulty due to prohibitive transportation costs. 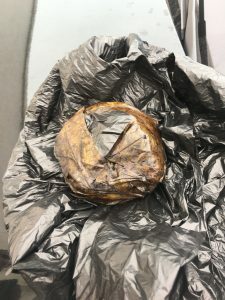 The thought of having to pay the police gas money for them to come over to a crime scene was absolutely shocking to me, and I suddenly understood how easy corruption could run rampant in such an environment. As we made our way out of town we were stopped by our first military roadblock, where I assumed we would be asked to contribute a small “tip”. But if the soldiers were inclined to ask for some baksheesh then they were quickly dissuaded by the personable Weeks. Weeks pulled out his cellphone to show a photo of him refereeing a Floyd Mayweather fight. 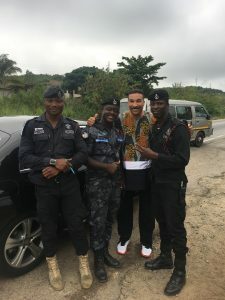 Ghana is a country of die hard boxing fans, and those soldiers were no exception. The soldiers instead requested selfies with us, which certainly was a surreal experience. I think the guy on the left is the only one who figured out I’m not a notable boxing celebrity. 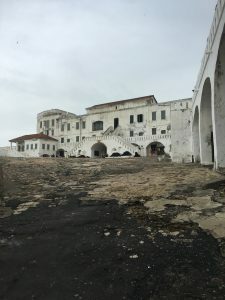 We made out way back on the road and after a few hours we arrived at Cape Coast Castle. We were mobbed the second we stepped out of the car, but this didn’t have that Denzel on the red carpet vibe to it. No, these were the vendors. 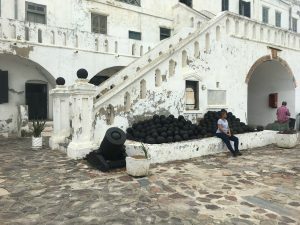 I’ve been around the world, and I’m use to aggressive sales tactics, but Cape Coast Castle was up there with Fez, Morocco for the most relentless. 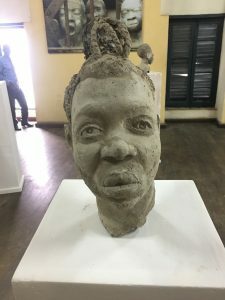 I made the mistake of letting a guy named Kofi show me his art (I am a sucker for art) and I quickly determined that he was in the process of hitting me with that “I’ll give you a gift scam” where I’d subsequently be expected to pay for the gift. I tried to tell him I didn’t want a gift from him but I knew it was not going to work. Kofi knew my first name and I knew when I walked out of that castle he would have something with my name on it. I was a bit hungry and fortunately there was a local vendor selling authentic Ghanaian fante kenkey. Now admittedly I had no idea what fante kenkey was, but as of yet I had not been disappointed by Ghanaian food and this had sort of a tamale vibe to it so I was sold. 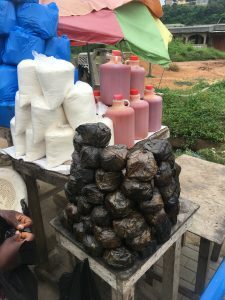 Unfortunately I would be told later that fante kenkey isn’t really all that good plain. You are suppose to put some sauce on it or eat it with soup. I basically bought some hatch green chiles and sat there on the side of the road eating them raw. Before entering the castle we walked to the back, where we saw an amazing view of the ocean and where some local children were eager to visit with us. 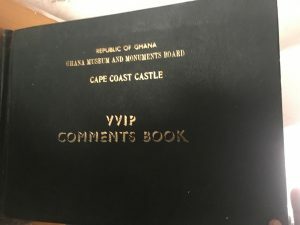 As we made our way to the front I couldn’t help but notice that the John Atta Mills Presidnetial Library was next door. I won’t lie, I really wanted to check it out. 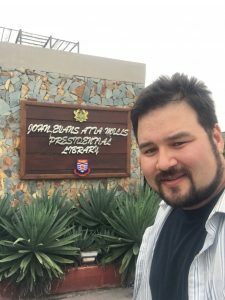 I’m a sucker for Presidential Libraries and although I knew nothing about Mills, I was very curious to see what a Presidential Library in Africa was like. 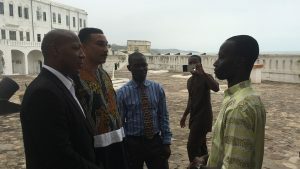 But it was time to enter the Cape Coast Castle and begin the tour. Regardless of one’s heritage or ethnic background, this was a powerful experience. 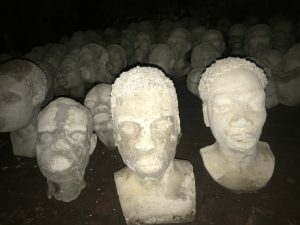 Arguably millions of African-Americans could trace their heritage to this very castle, and to discover what they endured during their final days in Africa was shocking and appalling. 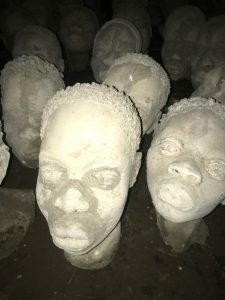 We soon made our way down into the “main slave dungeon” where one of the most powerful displays was exhibited. 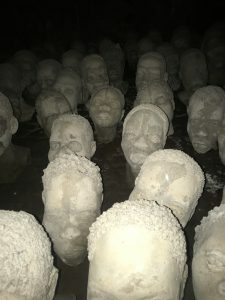 1,300 concrete heads created by famed Ghanaian artist Kwame Akoto-Bamfo depicting the lives of those who were transported across the Atlantic to a life of slavery in the New World. 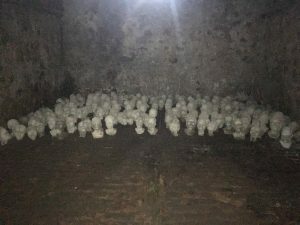 It was shocking, powerful, and effective and continues to haunt this visitor even a year after visiting the castle. We then made our way out to the grave of former Gold Coast Governor George MacLean. 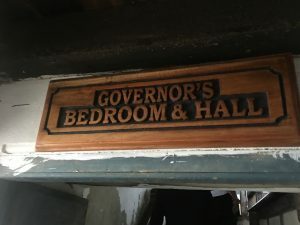 MacLean was governor from 1830-1844, although I won’t lie, after the visit to the Slave Dungeon I was not really able to process much from the part of the tour talking about MacLean’s life. 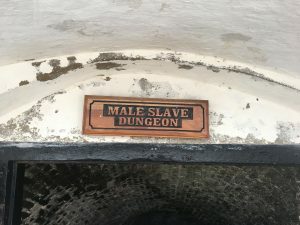 Nonetheless the courtyard was a stark contrast to the dungeons below, and I couldn’t help but think about how peaceful it was up here compared to the terror that the slaves endured below. 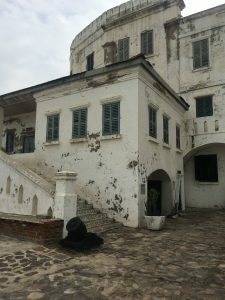 From the courtyard we made our way down to the most infamous site at Cape Coast Castle: The Door of No Return. 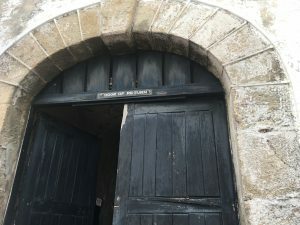 This doorway was the final passageway out of Africa, where they would be loaded on ships to the New World. 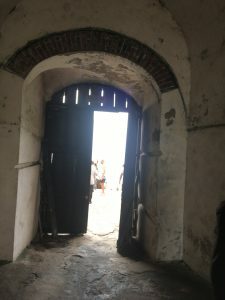 I could only imagine the fear and terror of those passing through the doorway hundreds of years ago…and one could not help but wonder if these poor men and women would think back about that moment for years after they arrived in the New World as slaves. Did they know this would be their last walk in Africa? Would they think back on that moment in the New World and wonder if there was some way they could have avoided that doorway…that final walk? Because on the other side of the doorway was Africa in all it’s splendor. 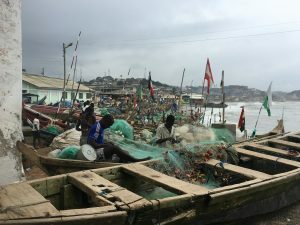 A small but vibrant Ghanaian fishing village and the ocean…a sharp contrast to the terror this castle once housed. 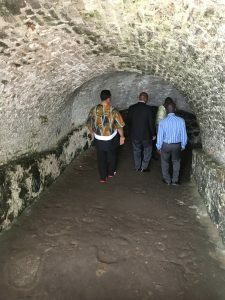 As we made our way back into the castle we made a quick stop at the walls where the cannons protected the British against potential attacks from the Atlantic, and then we made our way to the museum located in what was once the Governor’s Chambers. 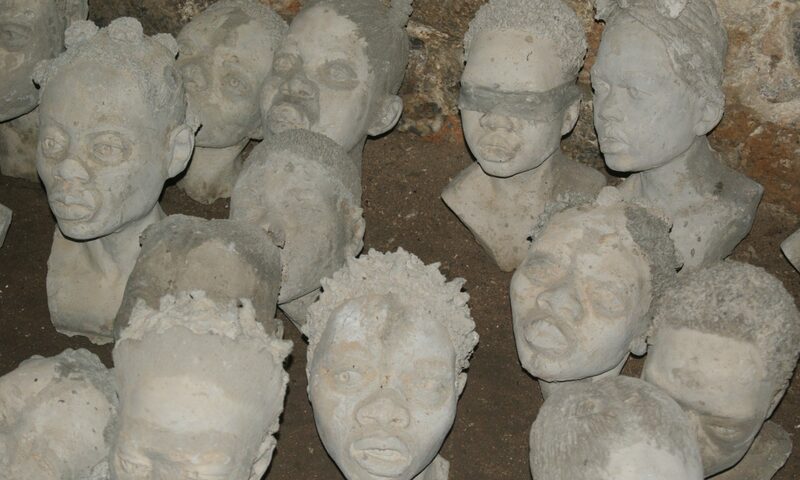 The stark contrast between the Governor’s Bedroom and the Slave Dungeon just below was shocking, and to see more of the concrete heads, only this time in the light, was another powerful moment. 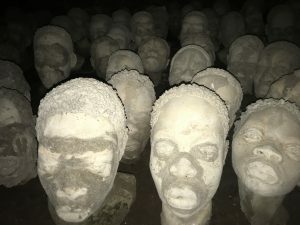 As we made out way to the museum where there was a display talking about the Slave Trade in the United States I realized how important this museum was, and how important it was to remain in the consciousness of all Americans. As we made our way out a young man who worked up front called me back. 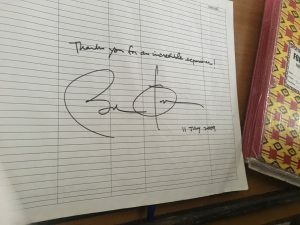 He wanted me to sign the special “VVIP” guest book. I quickly surmised that he had not reached the same conclusion as the soldier at the roadblock and he thought I was someone important. 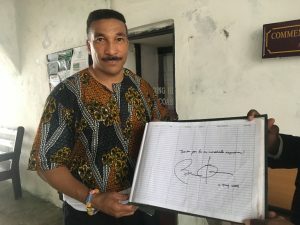 I readily agreed and suddenly realized he handed me the same signature book that former President Barack Obama had signed when he visited in 2009. I had never been trusted with a president’s signature before and I felt honored that they would consider me worthy enough to sign the same book. I quickly obliged and then had them snap a picture of me holding it up before I ran forward and called Tony Weeks to get his picture with it as well. By the time we left we were again mobbed by the vendors and their homemade trinkets that they designed just for us. Kofi had written a short message on a conch with my name on it and of course expected payment while Tony Weeks was given a larger conch with a message addressed to “Tony Whisky”, which we all admittedly had a good laugh over. 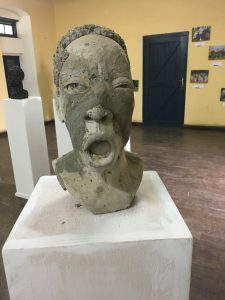 The journey was over, and we now had to make our way back to Accra…but deep down I knew this would not be an experience I would soon forget. I really believe that nobody who walks on those hallowed grounds ever does.